There's an unusual phenomenon occurring on La Cala beach, as many heart-shaped pebbles and stones are to be found. La Cala de Mijas in Andalucia, Spain has almost endless beaches. The boardwalk on the beach runs all the way to Cabopino Beach, almost 6 km away. The sand is well-tended by the municipality and is most beautiful and clean during the off-season. Obviously, in summer, it can get crowded, with carelessly strewn rubbish on the sand. In the off-season and at sunset, I walk my dogs along the water's edge from El Torreon in the village centre all the way to Butibamba Beach. While doing so, I suddenly noticed a heart-shaped stone lying on the sand. The next day, I found another, and it has been going on now for at least a month. Each day, I find at least one pebble or stone in the shape of a heart. I think this might be an unusual phenomenon, as I haven't seen anything quite like it before. When walking on the beach, each day is different. Some days the sand has been washed completely clear by the waves. On other days, pebbles are everywhere. While shells are a fairly rare occurrence here, sometimes you get lucky. Yesterday evening I found lots of still connected clam shells, cleaned out by the gulls. On other days, you have to beware of small jellyfish which have beached themselves on the sand. 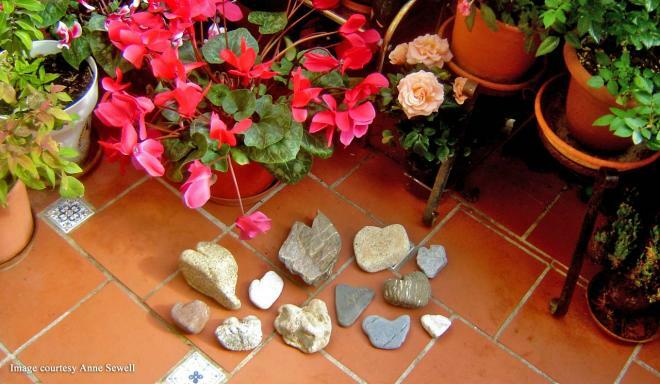 Enjoy browsing photos of my heart-shaped stone collection in the images below, including some larger ones that surround my plants on the balcony. Note they are not all perfectly shaped. Some take a Picasso or Dali slant in their shape. These stones are too big for my indoor collection, so they decorate the surrounding plants on the balcony. 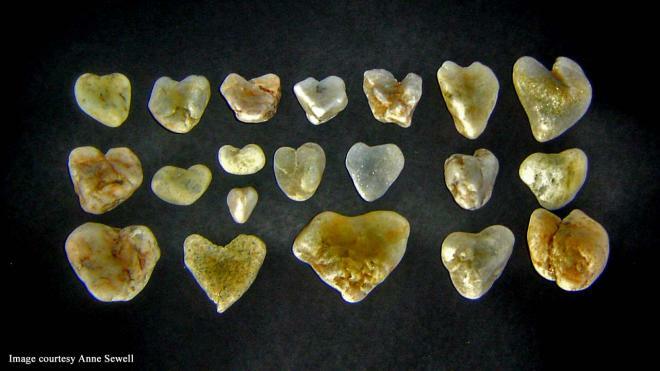 This selection of white stones includes some almost perfect heart shapes.